For Robert Cray’s 18th studio release, Robert Cray & Hi Rhythm (Jay-Vee Records), the singer/guitarist re-enlisted Steve Jordan as producer. Longtime listeners may remember the pair’s previous collaborations, 1999’s Take Your Shoes Off and 2014’s In My Soul, and like both of those efforts, Cray’s new disc has a distinct Memphis soul feel to it, even more so than on his other releases. Of course, one look at the title would probably be clue enough that this was the case, as Cray and Jordan (who also plays drums) team up with Charles (keyboards) and Leroy Hodges (bass), and the Royal Horns and Strings at Willie Mitchell’s Royal Studios in the Bluff City. The set consists of 11 tracks, eight covers and three Cray originals. The cover tunes include a pair from swamp rock icon Tony Joe White (“Aspen, Colorado” and “Don’t Steal My Love,” both which features guest appearances from Mr. White), “Mustang Sally” composer Sir Mack Rice (“I Don’t Care” and “Honey Bad”) , and the late Five Royales’ leader Lowman Pauling (technically only one song, the Five Royales’ early ’60s King hit, “I’m With You,” split in half), along with Bill Withers’ “The Same Love That Made Me Laugh” and Charles Jerue’s “You Must Believe In Yourself” (previously versions done by Johnny Copeland and O.V. Wright). Though most of the cover tunes have different regional origins, Cray and company infuse them with a health dollop of Memphis grease. 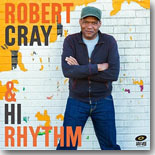 Cray’s three originals include the simmering “You Had My Heart,” a bit of a throwback to his Hightone/Mercury days, and the political commentary “Just How Low.” The highlight of the original tunes is “The Way We Are,” which sounds like it should be on one of those compilations of ’70s Hi Records hits (some sterling work from Charles Hodges on this track). In previous years, Robert Cray seemed to have gotten into a musical rut of sorts, his music always professionally done and pleasing to the ears and immaculately produced, but just not always as compelling as his Young Bob days --- maybe more like Middle-Aged Bob. However, his reunion with Steve Jordan over his past couple of releases seems to have put a hop in his step. Venturing headlong into Memphis soul territory, a genre that’s always fit him like a glove, probably doesn’t hurt either. Robert Cray & Hi Rhythm represents his earthiest, most passionate work in quite a few years.